Powerful Green SuperFood with an Advanced Food Based Multivitamin blend for strength, health, and ultimate wellness. 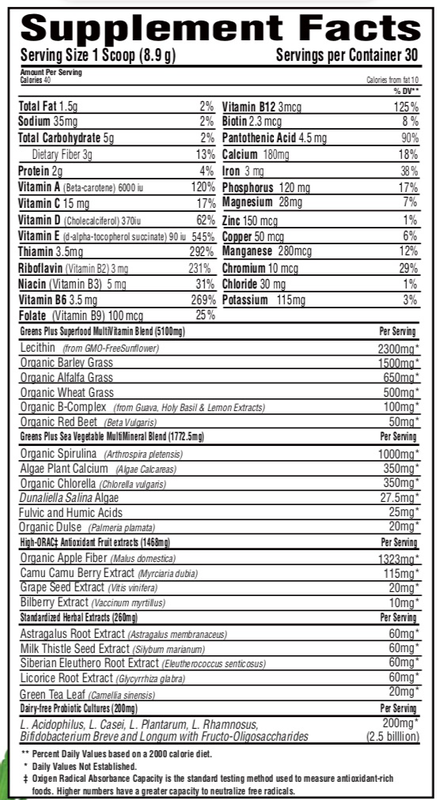 Greens Plus Advanced Multi Raw Superfood combines the original Superfood powder PLUS essential vitamins, minerals, antioxidants, enzymes and dietary fiber all in one convenient powder! The human body is a complex network of millions of cells. In every cell, thousands of chemical reactions are continually taking place. These reactions depend upon a diet rich in vitamins, minerals, and enzymes. When properly supplied, these cells produce loads of energy and give the body an abundance of vitality, endurance, and strength. However, being that the modern American diet is high in fat, cholesterol, and sugar, we are actually depleting the body of these essential nutrients.